This morning on Drudge I saw this article: "At $250 million, Los Angeles home most expensive listed in U.S."
I watched, mouth agape, at the video tour of this enormous 38,000 square-foot mansion in Bel Air, California. The structure sports "12 bedroom suites, 21 bathrooms, five bars, three gourmet kitchens, a spa and an 85-foot infinity swimming pool with stunning views of Los Angeles. There's also a 40-seat movie theater, a bowling alley, and a fleet of exotic and vintage cars worth $30 million." According to the developer, "only 3,000 people in the world could afford to buy it." And yet ironically, assuming a buyer is found, the house will likely be home to a smallish family or even a childless couple (not counting whatever servants are necessary to keep such a place running). In other words, just two or three or four people will be rattling around in this enormous house, while 99 percent of the time, 99 percent of the spaces will be unoccupied. I suppose it's a matter of "different strokes for different folks," but it seems kinda pointless to have a house that's so enormous, you can literally lose your children. Meanwhile I find myself trolling photos of "primitive" home interiors which, personally, I find much more appealing. Say what you will about this kind of home, you won't get lost in it. You have much better taste! They were probably asking $500 million before the election. The whole stat of Ca. is not worth half of that kind of money. Have made a promise this will be the last year to go down there, for warmer weather. You second example is a home, not just a house. Of course it would have to be located in the interior. I grew up in S. California and when I absolutely positively have to go there what gets me is when the plane is preparing for landing it is doing so in a sort of a cloud of smog. When my mother-in-law visited me here in the NW her first comments were that you could see the clouds. What view of L.A. are they talking about, probably the lights. Imagine when those lights are out? Yikes. I'm with you Patrice. I like small cozy, rustic homes. I live in beautiful Southern Illinois. (Shawnee National Forest area) As I was taking care of my animals a few days ago, an eagle flew over. That's the view I want. I like to live by the philosophy of my Mennonite neighbors. It's ok to have things as long as they're serving you, not you serving them. A house like that would require a lot of money to keep up. Therefore, I'd be serving it. No thanks. I'll take my small home that's paid for. in.The last video was Mountain family Robinson. Several years ago there was a PBS show "Frontier HOuse" I think. 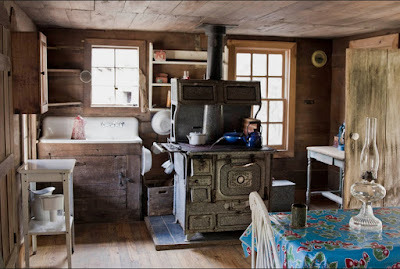 Kind of a reality show, designed to give moderns an indication of what life was like on an 1800;s farm, or Manor House, or.England during the Blitz..In this case a wealthy family from Malibu CA moved into a cabin and had to make do for 6 months...milking cows, cooking on a wood stove etc. The family was so bored at night in the dark...the Mom started singing, etc. In the end, the Mom said she realized that they never had to see ea other in their big mansion, and her children were in some ways 'unknown' to her, and that they would never have heard her songs from childhood if not for the experience. (She also said she felt like a slave to dishes, washing dishes). The children, 2 teen girls and a boy about 10, said they much preferred the cabin life in the country to their wealthy life in a mansion in Malibu. These PBS shows can be found on youtube if anyone is interested. We watched that show and mostly enjoyed it. There was a follow up done later where each of the families admitted they missed quite a lot of the lifestyle they lived on the show. The rich couple you are referring too had built a large home and seemed to really regret it. They divorced eventually. There was another family on there with a very unpleasant wife. She was often shown complaining about or arguing with the rich family. She was hard working and had some great skills. However, she hen pecked her husband to death and was incredibly jealious of other people. Made the children watch it to learn. They ended up divorced too. I saw a piece on this a couple of days ago. The degree of excess was astounding. You lokk at a place like this and say "What comes of this when the lights go out?" in the eyes.and ears toward that is a view ...beautiful. them by the time that I was ten. "Honey, quit trying to upsell this place: the 'West Wing' you are referring to is a barn." Is there a particular blog where you find the "primitive home interiors"? 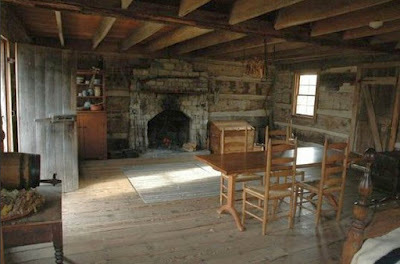 I follow a log cabin blog, but I really like those pictures you have posted. I wish. If there is one, I'm not aware of it (anyone else know?). 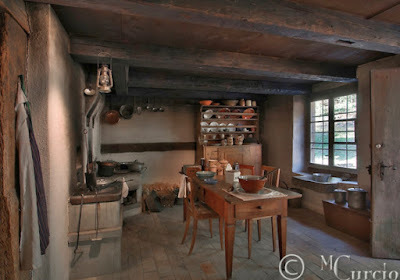 Instead, I just put "primitive interiors" into the Google Images search engine and see what occasional gems show up. The decor style you like is very similar to my Grandmother's. She called it "American Colonial Primitive". She purchased a lovely modern home and promptly gutted it and redid it all to look like that....in the middle of a large city. When she made her kitchen look like one in an 18th century log cabin our family thought she lost her mind lol. We loved to visit and play at being Laura Ingalls. My Grandfather was a contractor who constantly grumbled about how much money it was costing him to look poor lol. The furnishings, she bought at yard sales, are now worth a fortune. Go figure. I personally like more light and a bit more height, plus need more fabrics. But have sweet memories of this style and it can be done really well. If you and Don get the home renovation bug/decor bug that would be so fun to read about. Enola has done amazing things with her decor. I told her that some of her decor costs into the hundreds by me lol.